Commemorate the true love you feel for your significant other, with the delicate beauty of this semi-eternity wedding band from Miadora. This simple, elegant piece features a 10-karat white gold construction with twenty round-cut sparkling white diamonds for celestial splendor. Diamond Snob who adores these! I bought two of these bands back in 2010 because I wanted some inexpensive and modest bling. 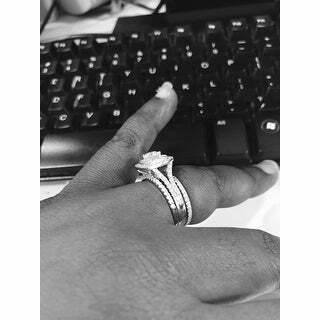 I am obsessed with diamonds, especially rings, so I was very critical of them when they arrived. They were perfect. After wearing them daily for 2 years, I finally sent them off to my appraiser. I was shocked at what I received. Collectively they are worth over $2,000. Needless to say, this is an excellent purchase and a wise investment. They sparkle, are durable, and look great solo as well as next to other large or small rings. TOTALLY worth the purchase! This ring came exactly as described and is beautiful. 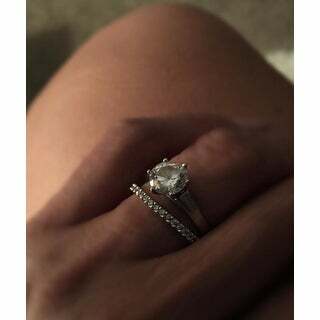 I purchased it was a wedding band to compliment an everyday engagement ring I wear. My original set it very fragile so this was an economic alternative to replacing the set. I actually love this ring so much that I don't feel it's a downgrade. 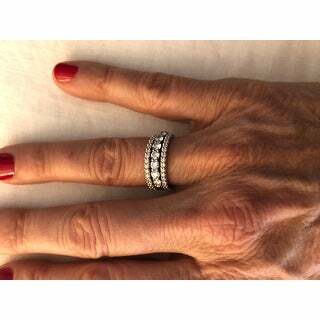 I feel just as proud to wear it as I do my 1 original carat eternity band. This band is about 2mm thick and the stones are bright and clear, even under indoor lighting. You can definitely see the stones individually, they do not look like chips. They are set low enough into the ring that I don't anticipate any stones falling out. The rose colored metal perfectly matches the metal on the engagement ring I purchased from a popular jewelry store. I have a very active job where I use my hands a lot in and out of water, and there has been no damage to the stones or metal so far (I have been wearing it for about a week). It sparkles a great deal and is not too small. It compliments my three stone engagement ring so well that I am considering purchasing a second band to go on the other side. It looks precious even alone. I highly recommend this ring as a sweet sentimental gift or a wedding band. I have paired this wedding band with the Miadora 10k white gold 2 3/4ct TDW black and white halo diamond solitaire engagement ring and couldn't be happier! 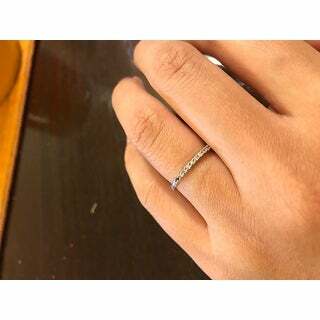 This wedding band is perfect pair for my ring, it's a thin band but also very sturdy that it will not bend easily. Very glad I saw this band as a recommendation when purchasing my wedding ring. Miadora is a high quality company. This ring is absolutely stunning! It also feels very comfortable on my finger. The diamonds are bright white, just beautiful! And the gold is also bright white. I love wearing it everyday! 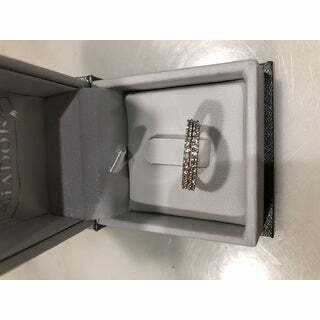 White gold has a nice polish and the diamonds sparkle nicely compared to the size of the band (1mm) Very nice buy for the price, the band is very thin, I would reccomend this if you like stackable rings. 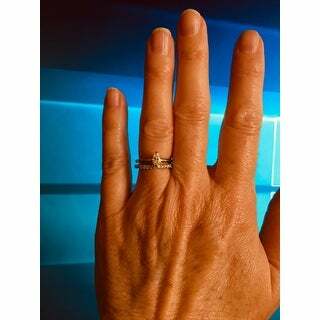 I recently upgraded to a new engagement ring and wedding band for my 20 year wedding anniversary. I went to a jewelry store in town and purchased a ring and band. However, the band i purchased was so small 1/16 ct. ( but pricey) so i just decided it was not the right band for my ring, it just simply got lost next to my ring. I took a chance and bought this Miadora 1/5 ct. from Overstock and i received it today. Very quick delivery, i may add. It is bigger than my other band,( which is the most petite size you can buy) not a lot, but enough that you can see it and it makes all the difference. It is beautiful! It is much shinier, and just an overall better quality ring than the one i had previously purchased elsewhere and paid almost 200.00 more for. I will post pictures of my new band and the other one, so you can see the difference. 1st pic is my new Miadora band. 2nd and 3rd pics show the Miadora 1/5 ct on the bottom of my finger and my previously purchased 1/16 ct from a popular national jewelry store. 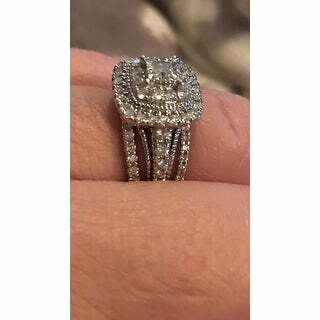 I do recommend this ring if you are looking for a petite diamond band but not too small. It is beautiful in person! I WAS A LITTLE SCEPTICAL AS TO WHAT THIS RING WOULD LOOK LIKE, AS I HAD NEVER ORDERED JEWELRY ONLINE BEFORE. 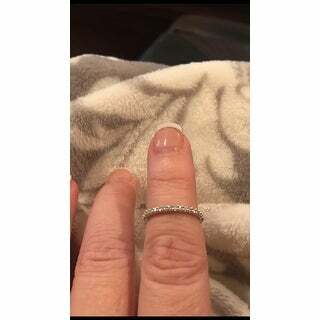 MY GRANDAUGHTER HAD PICKED OUT THIS RING AS A GRADUATION PRESENT AND SHE WANTED IT IN WHITE GOLD. WHEN I OPENED THE BOX, THE RING WAS ABSOLUTELY GORGEOUS. THE SPARKLE OF THE DIAMONDS WAS JUST BEAUTIFUL. SHE WAS VERY PLEASED WITH THE RING, AS WAS I.
I've been searching for the right size diamond bands to go with my wedding ring for a few years now and these were a perfect match. I've had bands before from another jewelry store, but they lost diamonds along the side of the bands because of my size being so small. It makes the prongs on the outside diamonds very delicate and you risk losing a diamond here and there. 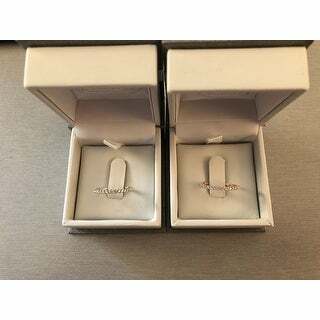 Well I don't want to walk around with a band that has lost a diamond so I sent those back as opposed to repairing them and then searched for a few more months until I found these rings and they are perfect. I was nervous to buy this band, based on the reviews that said the diamonds were very very small. I was pleasantly surprised when they arrived to find that it is a gorgeous diamond band that accents my wedding band beautifully. I bought one in both rose gold, and white gold. Great value for the money, and I did my homework. I’m so glad I purchased these bands. I was very skeptical about ordering a wedding band online without being able to try it on, and also about it being from Overstock, but honestly, it's perfect. Yes, it's small, but I don't think it's any smaller than what's shown. I wanted something dainty to go with my engagement ring, and this fits and looks gorgeous. I ordered it Friday and received it Monday; I could not have been more pleased with the time! It really is beautiful. If you're looking for something small, but still nice, this is really a nice ring. 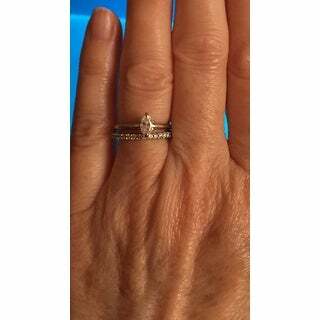 I have a large solitaire and this little sparkling band is perfect to show it off. Lost a diamond less than two weeks. The ring was okay. It doesn't have all that much sparkles in it, but what I am not happy with is a diamond fell off after wearing it for only 2 weeks. Poor product! The width of the band is smaller than I anticipated but is very beautiful. It is a great accent ring with an engagement ring. I recommend buying this wedding band. The item was fine for what it is. After a while, after normal wear, a stone went missing. The ring was not dropped or hit against anything, I didn't notice it until later. I called Overstock but they refused to exchange it. I was using it as a wedding band so it was kind of important to wear it, but I no longer can. Great ring it is beautiful! So dainty and sparkly, think I'll be ordering another soon. It is a great product for the cost. Looks lovey in person and my wife really loved it. I would recommend the product looking for an impressive looking piece of jewelry at a reasonable price. Quality is good. Love this ring! Very delicate 1/5 ct but you can wear it with just about anything, to add the sparkle and feel fabulous every day. Would recommend! Well worth the money! Would buy again. 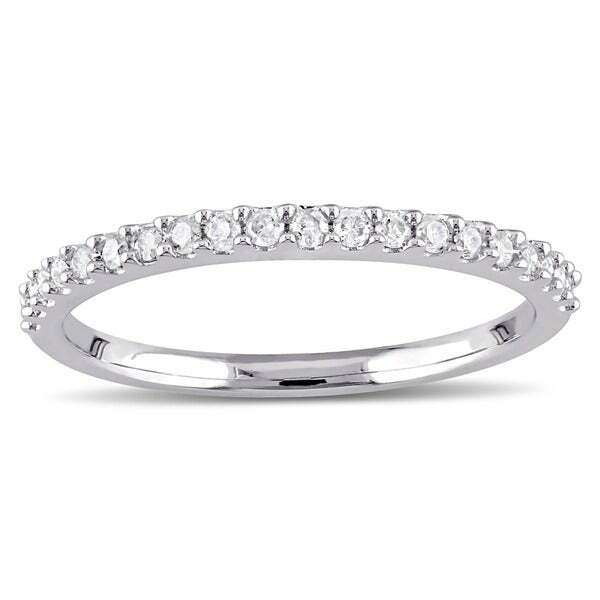 This is a nice thin band with just enough sparkle to add to my solitaire diamond engagement ring. I think it would be a pretty stackable ring too and may think about buying a second one for the other side of my engagement ring. Absolutely love this band! It goes perfect with my engagement ring! It's dainty and feminine. I receive compliments on it all the time! Exactly as pictured. Looks even better on. "is this a real diamonds ring "
Yes, the treatment code on this rig is ''N''. Treatment Code N: The “N” symbol is used when natural stones have not been enhanced by any method. "I need a size 4...can this ring be sized ??" Yes. I had my ring sized down. It cost $ more because it has to be plated for the white gold from yellow. Hope this helps. I wear mine as a toe ring and I love it. Have worn it everyday with no problems whatsoever! "It says the diamonds are rose colored. Is this true? The pictures look like white diamonds." The diamonds are G-H White Diamonds. "I’m looking for a 1.8mm what is the width of this ring ?" It is the name of the manufacturer. "How far do the diamonds go down on a size 4.5? Is it more than half eternity?" It's only slightly more than a half eternity. "Will size 5.5 or size 6 be in stock in white soon?" Please keep checking back with us, we update our inventory daily.